.....aaaannnnnddddd we're back! With the official first day of fall under our belts this week, it's time to begin chatting about wine again after some needed R & R. Of course, just because I haven't been blogging about wine doesn't mean I haven't been tasting it - or drinking it while on vacation or hanging out with friends. Curious to hear about a few highlights? 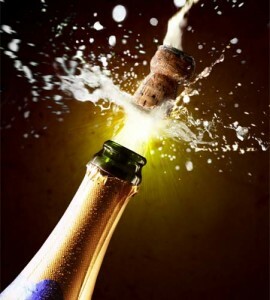 Today we'll whet your whistle with the "Best in Show" evening - a pairing of Champagne and Lobster! For my birthday I received a bottle of Guy Larmandier Grand Cru Blanc de Blancs champagne. What better pairing is there than lobster? Quite possibly... none. (And when you are vacating on an island in New England, fresh lobster isn't so hard to find.) The wine was delicately, optimally frothed, with a lovely leesy texture. Some toast and a hint of almond and truffles on the nose led way to a giant helping of red apples, pears and lemon zest (all buoyed by it's very dry nature) on the palate. All of these well integrated elements came to bear even more marvelously as we dug in. Well, lobster is a meaty, succulent and almost sweet, not too fishy, creature of the sea. The acidity in well-made champagne cuts through the fleshiness of the meat and the richness of the butter you may be predisposed to dress it in. What about the ever-present wedge of lemon you are also inclined to squeeze atop the lobster? Think of champagne as the other part of the whole, as layers of innate citrus flavors marry with the lobster you've just tasted. And then there is the texture. Richness lifted by citrus/acidity create a delectable, mouthwatering result. A tough one to beat, indeed! What was your summer's wine or paring "Best in Show"? Baboons, bubbly, accolades and more! I have a healthier than normal appetite, I'm told. But it seems South African baboons do, too! Check out this hilarious (but costly) piece on these "Thieving Baboons". The age-old question "does stemware really matter?" has a simple answer: yes. It's because a good glass can really help display aromas and flavors by channeling them in a precise way to your senses. Riedel is the company that has set the bar on this technology. And so they took their a competitor to the mattresses recently when Eisch advertised a breathable glass. Read all about the outcome here. Speaking of glass, looks like the Champagne Bureau is getting greener! Each bottle of Champagne will now weigh 2oz less than before. Discover the full implications of this move here. Last but not least, I had the pleasure of meeting the famed Randall Graham of Bonny Doon vineyards a couple of weeks ago at a local trade event. Looks like I had the opportunity right before his celebrity really took off! Graham was just inducted into the Vintners Hall of Fame. Cool stuff. Which wine headline caught your attention this week? I'm not sure I will ever fully understand why some known wines get a make-over largely in name only. A few years ago it was Moet doing away with their White Star Champagne bottling and replacing it with a slightly different iteration (in terms of the style of wine itself) and calling it Moet Imperial Brut. White Star was a really recognized name in the marketplace and today it is still a point of confusion for many looking for the White Star, and being handed the Imperial Brut. Is the wine different? Yes, a bit. But why not roll with the old name? Now it looks like La Mission Haut Brion is making a similar name shift. Check out this brief Decanter article on why the change. Then tell us, as a consumer, does the reasoning make sense to you? Do you care? Next up we have an article that three different friends sent to me (from two different sources), to ensure I didn't miss it: the latest in wine health news reports suggests that women who drink have a better chance of avoiding obseity. Egad, will these studies ever cease? An entertaining read if you, like me, don't mind another guilt-free reason to keep pouring your nightly glass of wine. Last but not least, we have a fun Old World vs. New World showdown on The Tasting Docit! On Friday March 19 you and other foodie nerds at WGBH can enjoy the fun for a mere $25. And there will be music to further enrich your tasting experience. Check it out!